gond ke laddu is a popular winter sweet from north india. 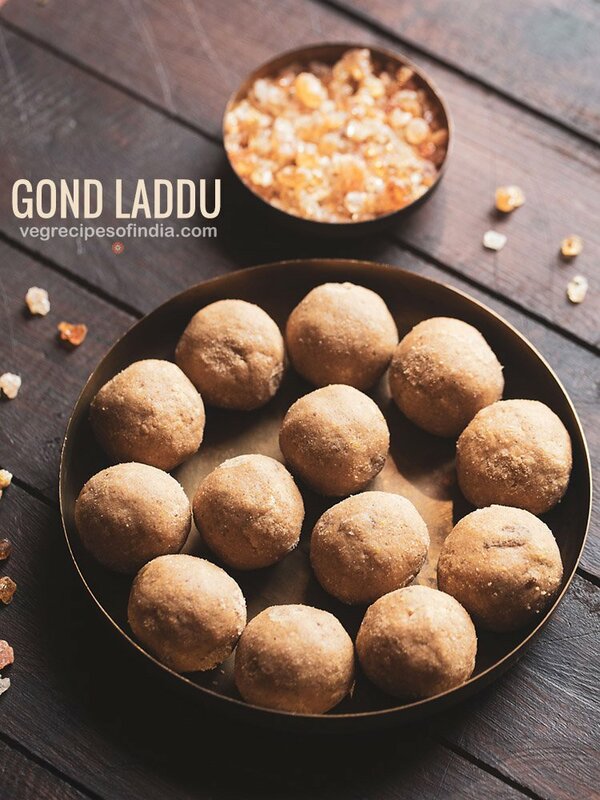 this nutrient dense laddu is made of gond aka edible gum, whole wheat flour, ghee and dry fruits. gond laddu are tasty as well as healthy. this recipe can be halved, doubled or tripled. gond ke laddu recipe with step by step pics. gond laddu is a popular sweet made during north indian winters. 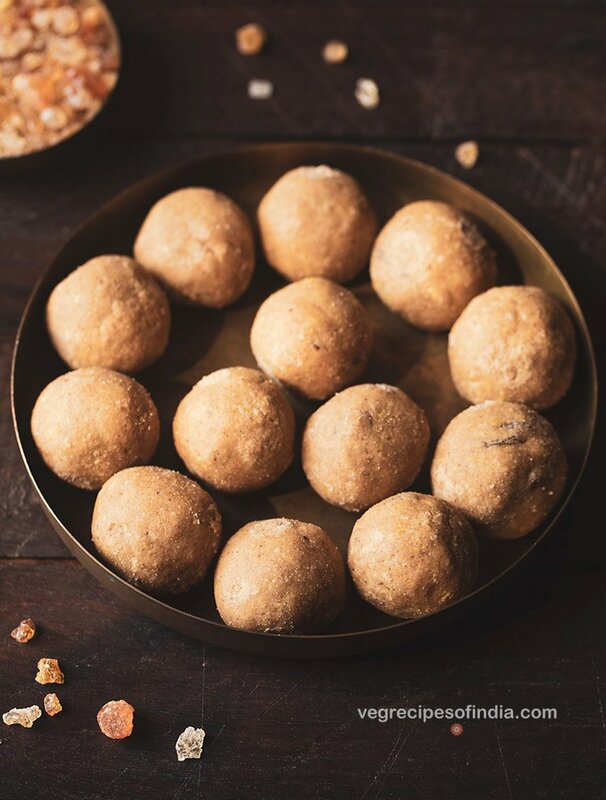 these tasty gond ke laddu are made with gond which is also known as edible gum, whole wheat flour, ghee and dry fruits. making gond ke laddu is a winter ritual in my home every year. we usually make 1 to 2 kilograms of gond ladoo during winters. even though i make gond laddu every year but for some reason was not able to add the recipe on the blog. so this year i made these delicious ladoo again for the blog. gond laddu is also called as dink ladoo in marathi language. this gond ke laddu recipe is a punjabi recipe that i originally learnt from my mother-in-law and have been making it for many years now. 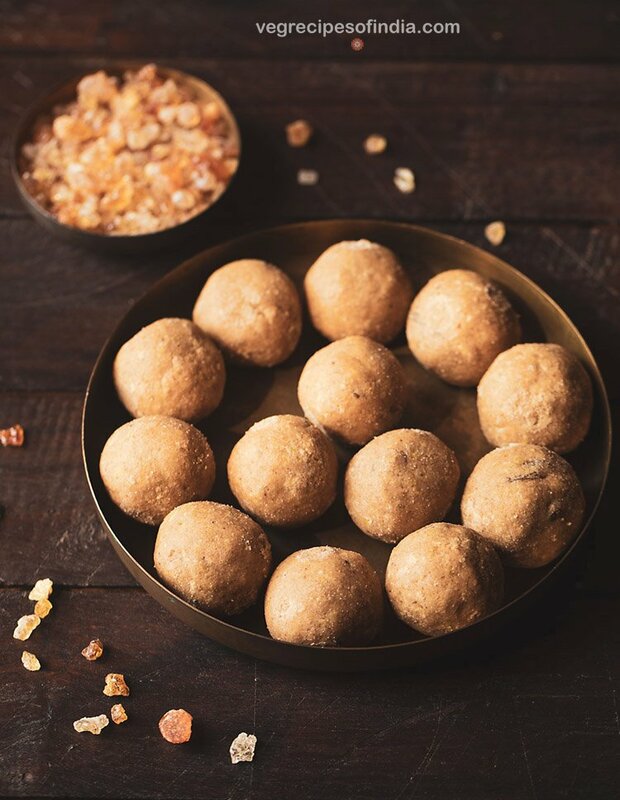 gond ke laddu are nutrient dense, heavy and filling – as apart from gond, whole wheat flour, ghee and dry fruits are also added. 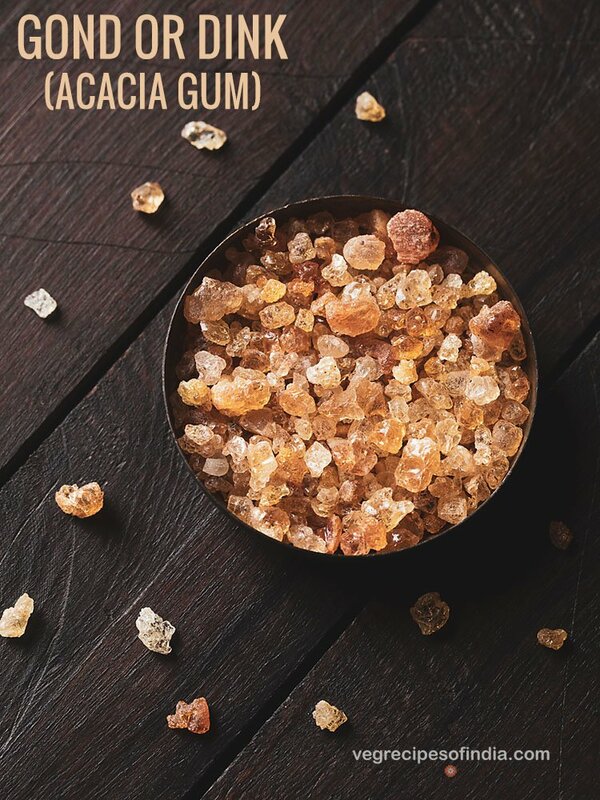 tragacanth gum is also known as katira gond in hindi and badam pisin in tamil. 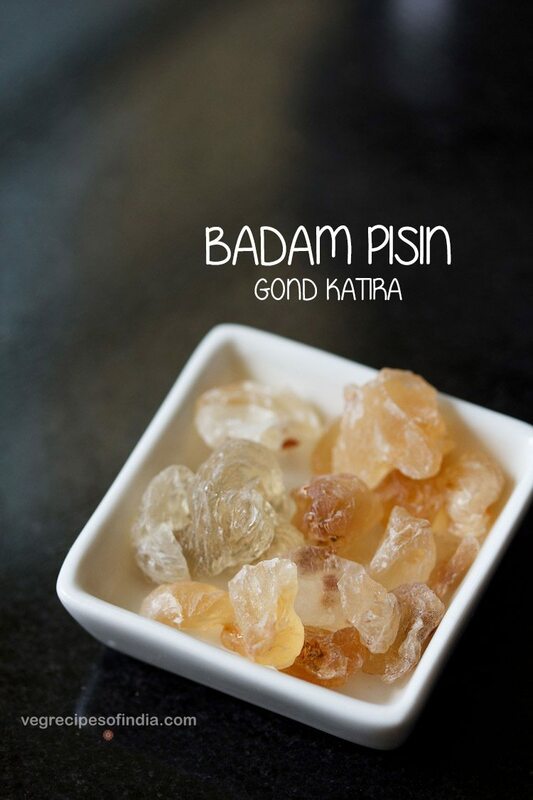 katira gond has cooling properties and thus is used as a cooling ingredient in summers. it is added to summer cooling beverages like gond sharbat, jigarthanda recipe, falooda etc. acacia gum is the dried sap of the acacia tree which is known as babul tree (kikar) in hindi. it is known as dink in marathi or gond or gaund in hindi. to make gond laddu, acacia gum is used. 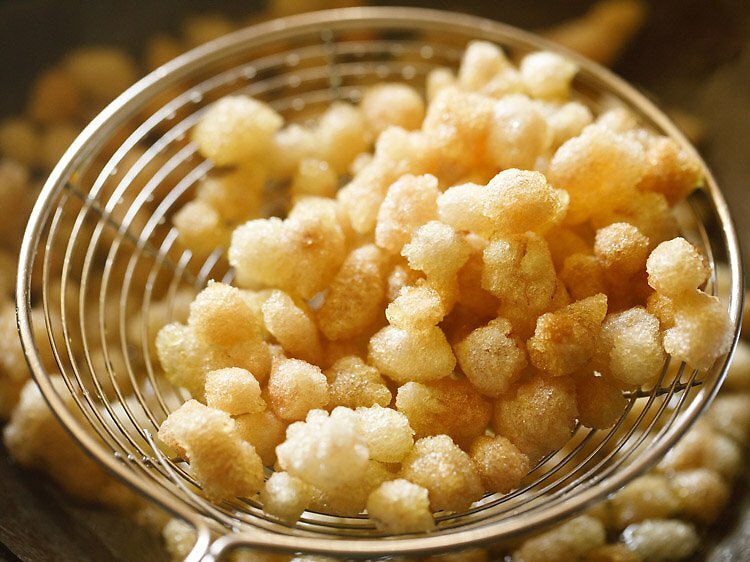 gum arabic is heaty and thus consumed during winters as it helps to keep the body warm. gond ke laddu and gond panjiri are popular winter sweets made in many north indian regions. gond laddu is also given to nursing mothers. gond is a good source of calcium and thus helps in keeping the bones and teeth strong. being heaty, it helps to keep the body warm during cold winters. 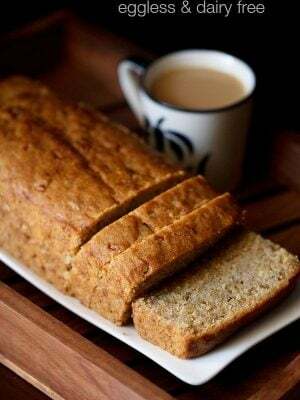 it is also an excellent source of energy and thus consumed during winters and given to kids. gond is given to nursing mothers as it helps in strengthening the backbones and aids in milk production. gond also helps in giving energy and strength to mothers after pregnancy. it also helps the uterus to get back to its size post child birth. important note – avoid having gond during pregnancy due to its heaty nature. 1. use good quality gond and buy from a known source. usually gond is available in ayurvedic shops. you can also buy them online. 2. in the laddu, apart from gond dry fruits are also added. i usually add dry fruits which are easily available like almonds, cashews, raisins etc. you can even add other types of nuts and seeds. 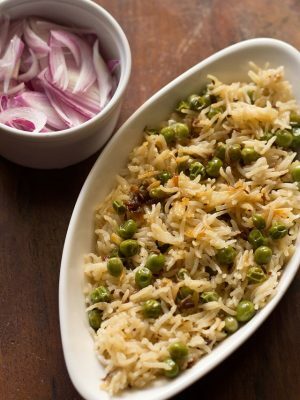 some variations also add poppy seeds, makhana, dry coconut, dates. methi seeds etc which i don’t add. you can increase the amount of nuts and dry fruits if you want. 3. it is best to make gond ke laddu in desi ghee or homemade ghee. 4. gond has to be fried well as even a slightly raw gond can cause stomach problems. 5. gond has to be deep fried. 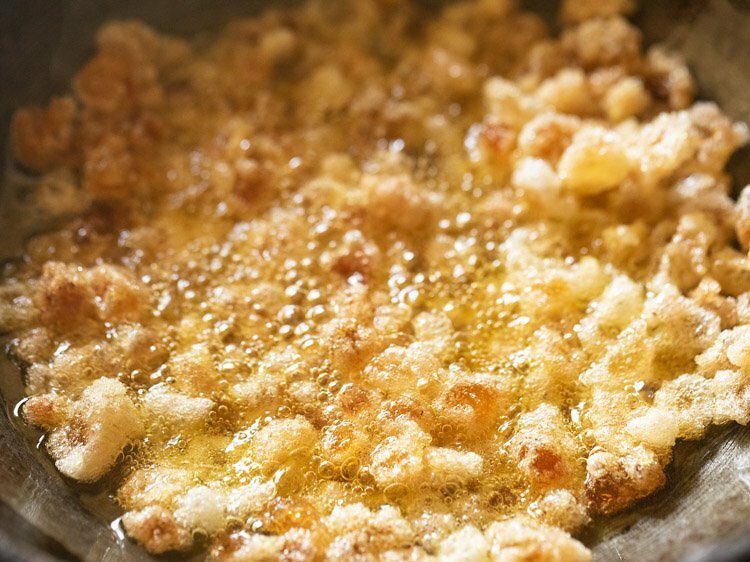 if you pan fry or shallow fry, then they may not puff up well. 6. gond laddu are shaped when the mixure is still hot. if you are not able to shape laddu, then add 1 to 2 tablespoons ghee. 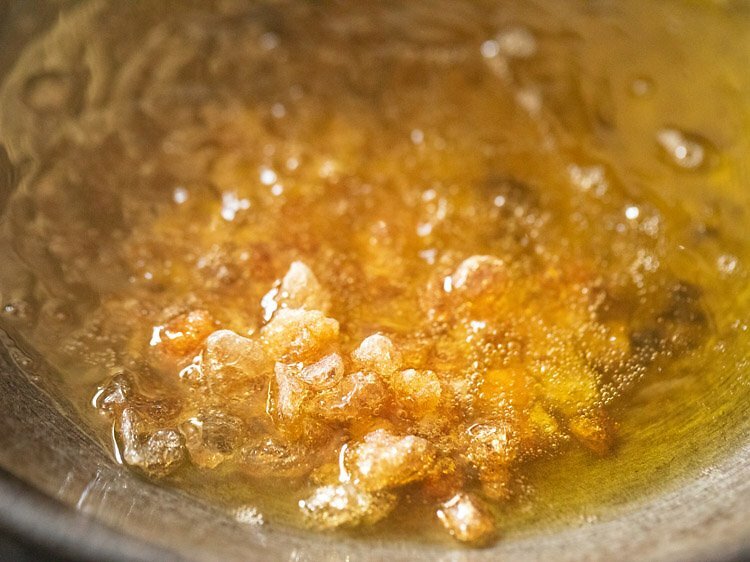 ghee should be in a solid state when adding but should be in a semi-solid state. 7. do also roast the wheat flour very well. 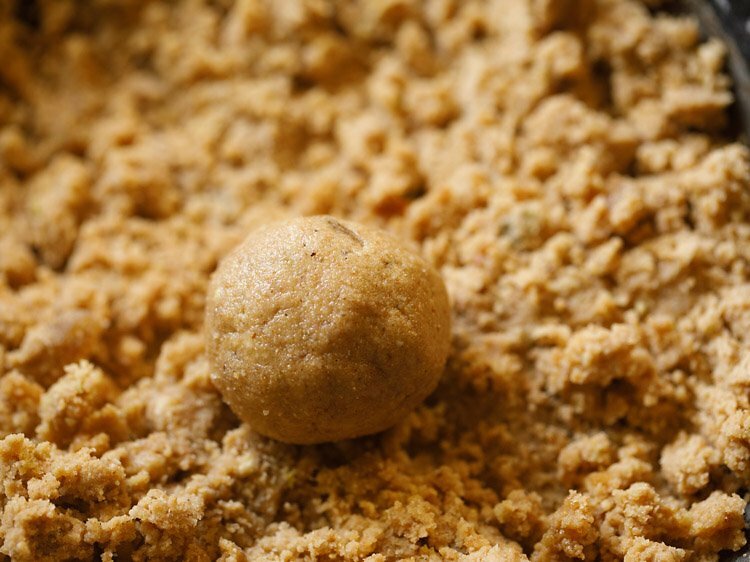 a slight rawness in the flour will spoil the taste and texture of the ladoo as well as not suit the stomach. 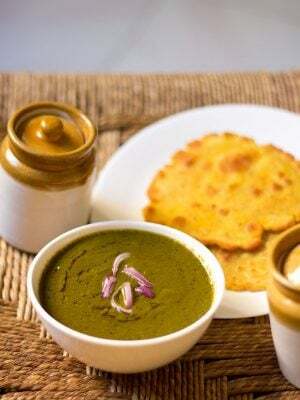 8. do not add less ghee than what is mentioned in the recipe. 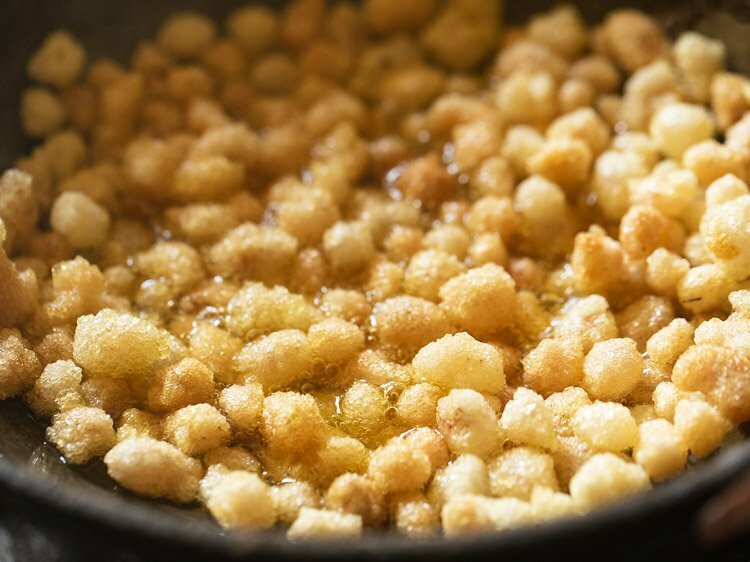 here ghee not only adds flavor, but also helps in binding the ladoo. 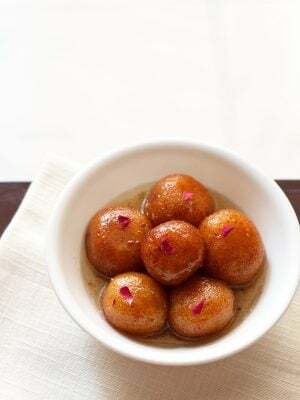 moreover, ghee also helps in digesting these ladoos. 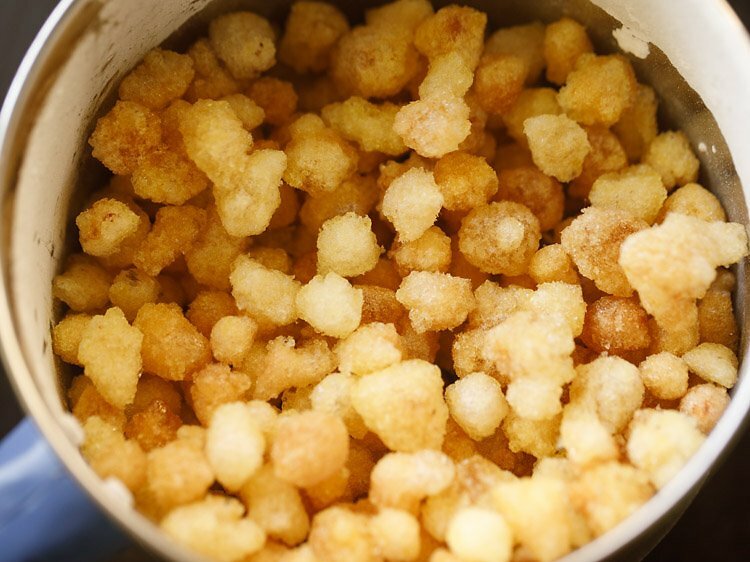 if the ladoo cannot hold shape and flattens then it means there is more ghee. let the mixture cool completely and then shape into laddu. 9. we always add khand or khandsari (desi raw & unrefined sugar) while making gond laddu. you can even use refined sugar or a better alternative would be jaggery (gud). 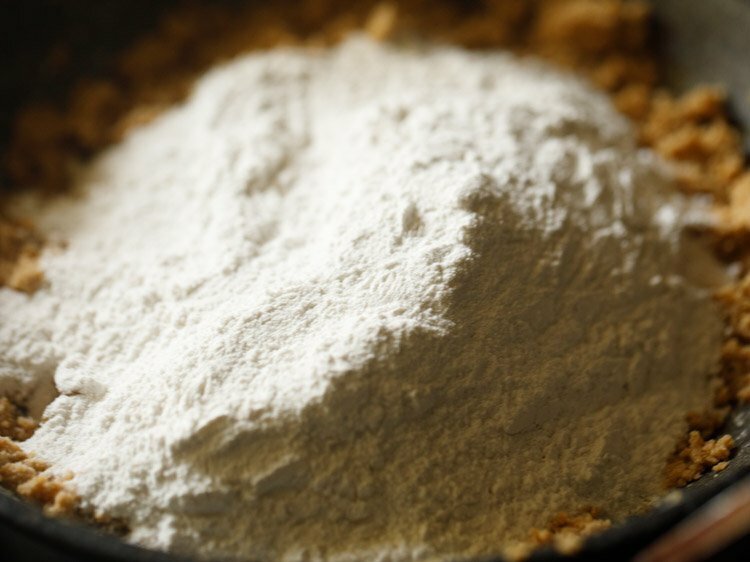 in the recipe post, i have ground the unrefined sugar to get a fine powder. you can even use store brought sugar powder while making laddu. 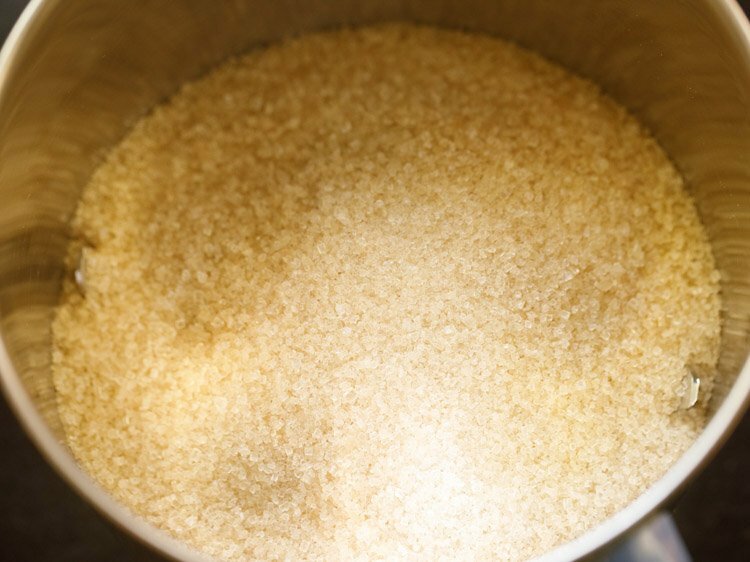 take sugar in a grinder jar. grind to a fine powder. remove in a plate and keep aside. keep all the ingredients ready before you begin. heat desi ghee in a heavy kadai. please do not use a non-stick kadai. a heavy iron kadai or aluminium kadai works best for frying gond. let the ghee melt. keep flame to medium low. 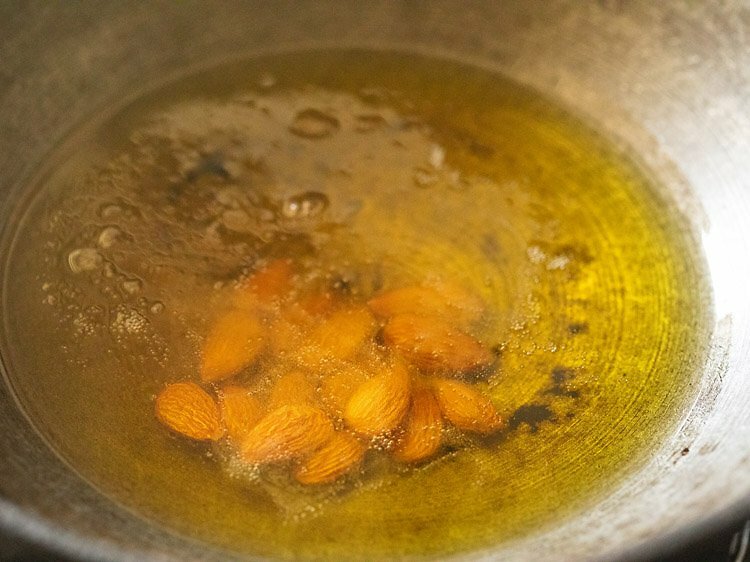 stirring often fry almonds till their color changes and then remove with a slotted spoon. keep aside. 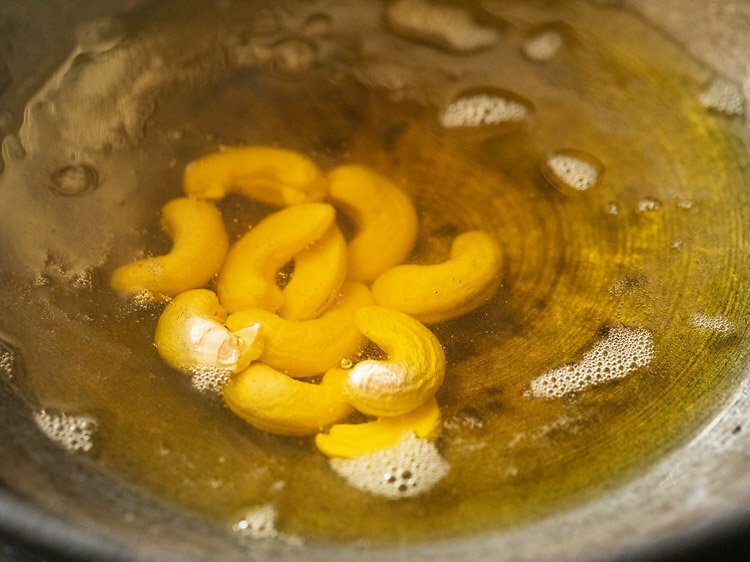 stirring often fry cashews till they become light golden or golden. remove with a slotted spoon and keep aside. 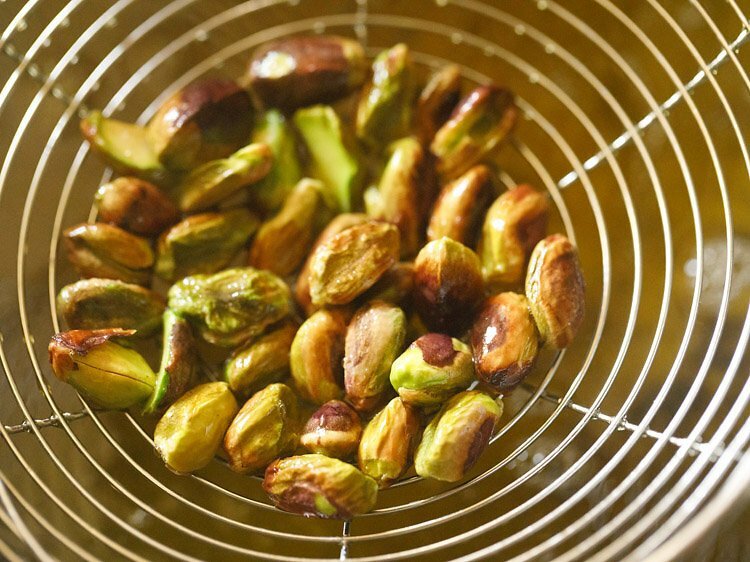 add pistachios. fry for some seconds till their colour changes. remove and keep aside. now in the same ghee, add one piece of gond. 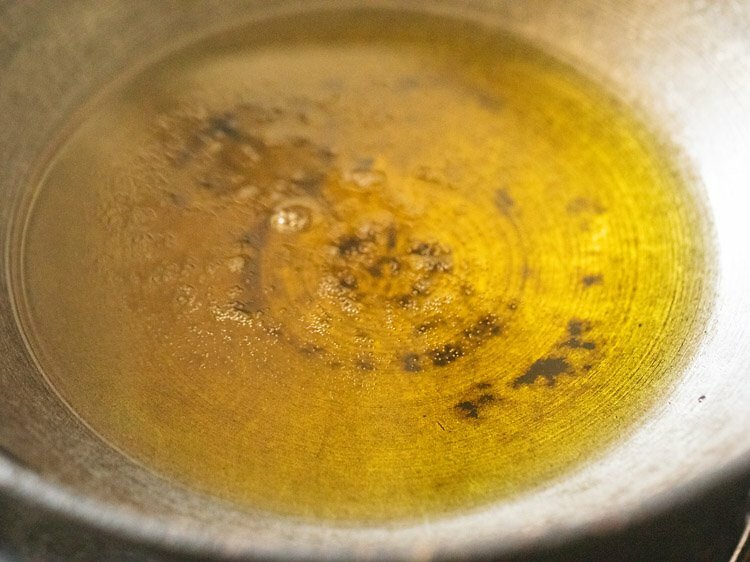 if the gond comes up gradually and puffs up, the oil is ready for the gond to be fried. if the gond settles down in the oil, then increase the flame and let oil become hot. if the gond comes up quickly, then oil is very hot. reduce the flame to lower the oil temperature. add gond in two batches. if you are an experienced cook, then add gond in a single batch. stir non-stop and fry gond till all of them puff up. the gond pieces have to be fried evenly. so stir non-stop. 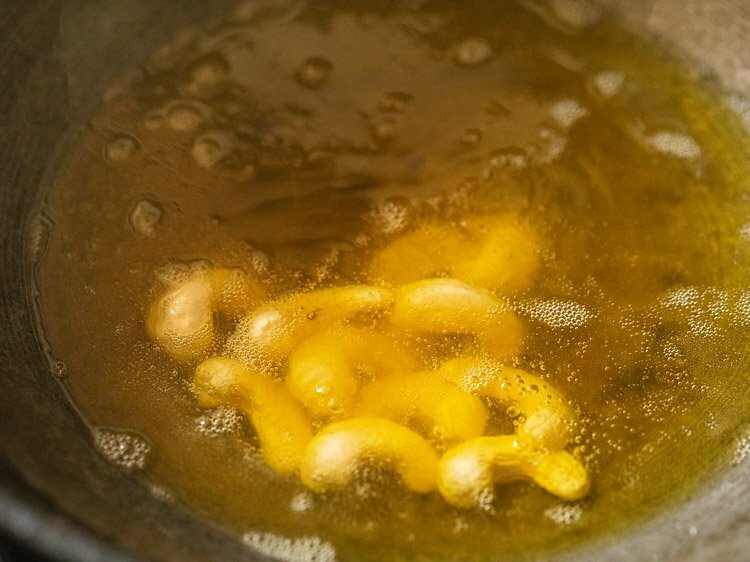 fry them well in ghee and do not burn them. remove the puffed up gond in a slotted spoon. keep fried gond aside. 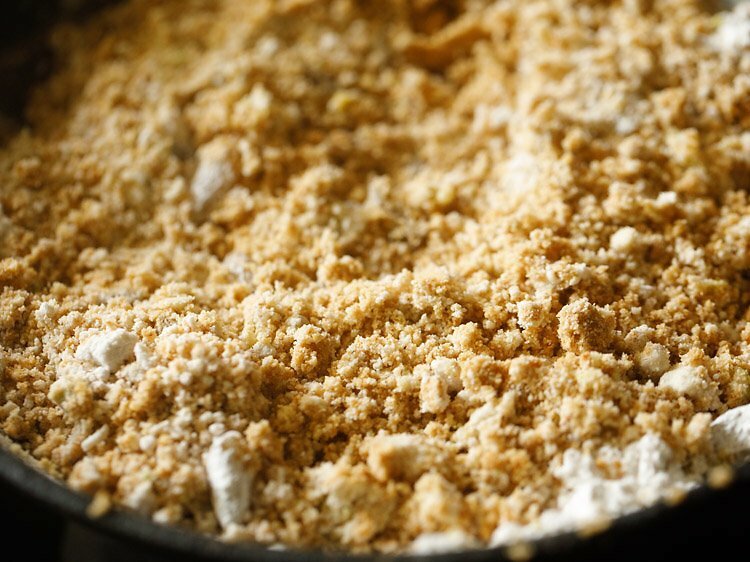 reduce the flame to a low and then add 2 cups whole wheat flour in the same ghee. 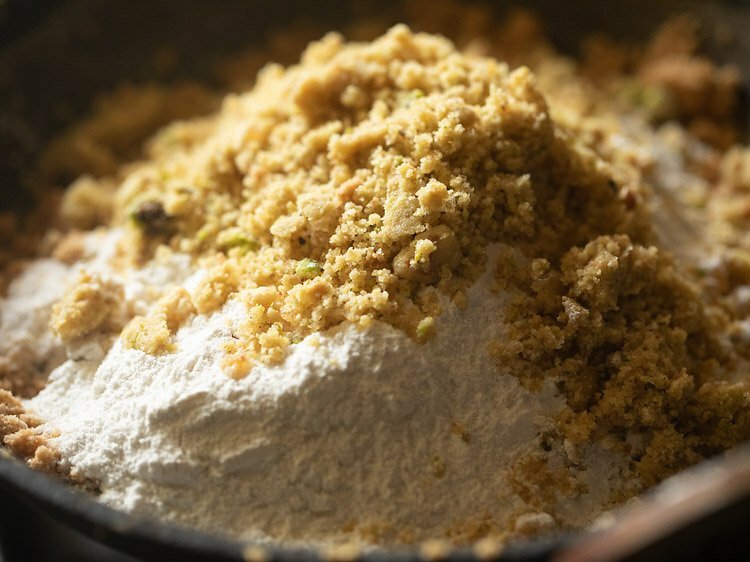 mix flour very well with ghee. 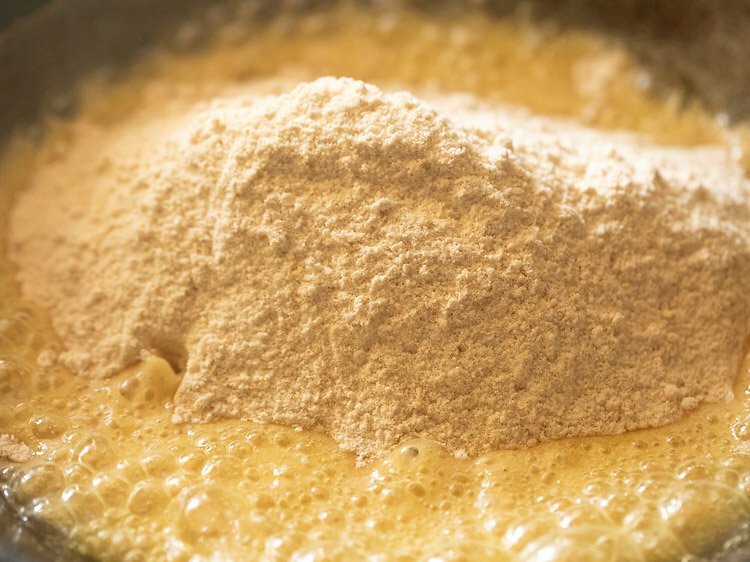 begin to roast flour with the ghee. meanwhile when atta is getting roasted, add dry fruits in a grinder jar. also add the fried gond in a dry grinder jar. pulse and grind to a semi fine or coarse powder. you can keep dry fruits whole if you want. do note that atta is getting roasted when you grind gond. If you are not able to multitask then switch off flame after frying gond. crush gond in grinder. then switch on flame again and let ghee become slightly hot. add atta and roast. you can also use a belan (rolling pin) and crush gond. keep the powdered gond and dry fruits aside. continue to keep on stirring and roasting the atta. roast atta till its color changes and you get a nutty aroma. then stir nonstop when you see the flour changing its color. stir and roast till the atta becomes golden or brown. overall it took me a total of 17 minutes for the atta to get roasted to perfection (i had used a heavy iron kadai). note that the timing will vary with the material, size and thickness of the kadai or pan. if you use steel kadai, then it will take less time. switch off the flame. keep the kadai down and raisins and cardamom powder. next add the powdered sugar. 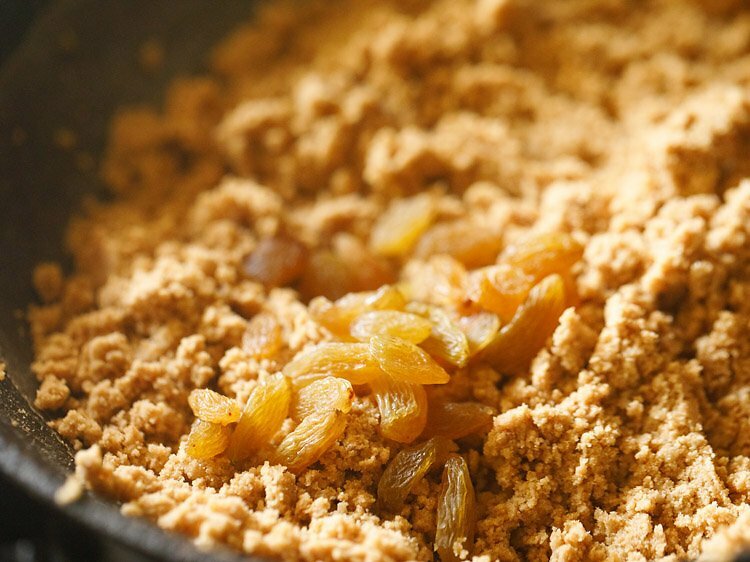 add the crushed gond and dry fruit mixture. begin to mix with a spoon. 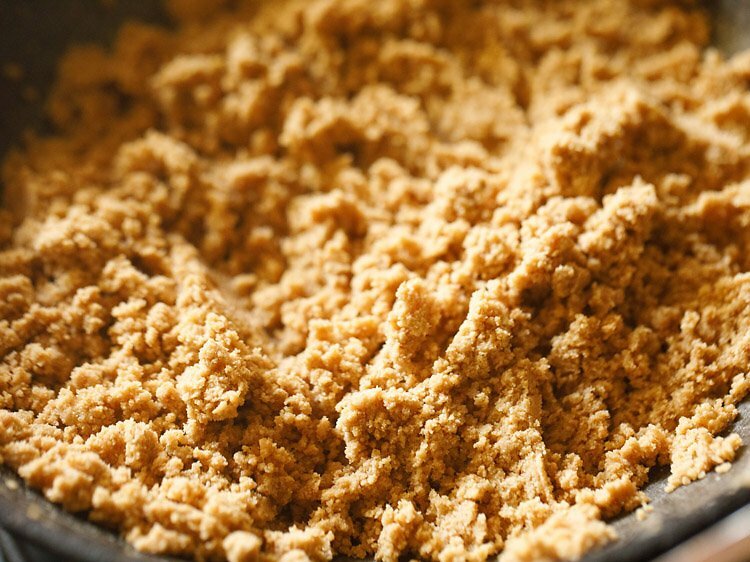 while mixing, break the sugar lumps if any in the ladoo mixture with a spatula or spoon. mix very well. when the gond laddu mixture is still hot and the heat is tolerable to you, take a heaped size portion of it in a spoon or in your palms. shape in a round ladoo. in case the heat is not tolerable, then do wait for some minutes. avoid burning your hands. 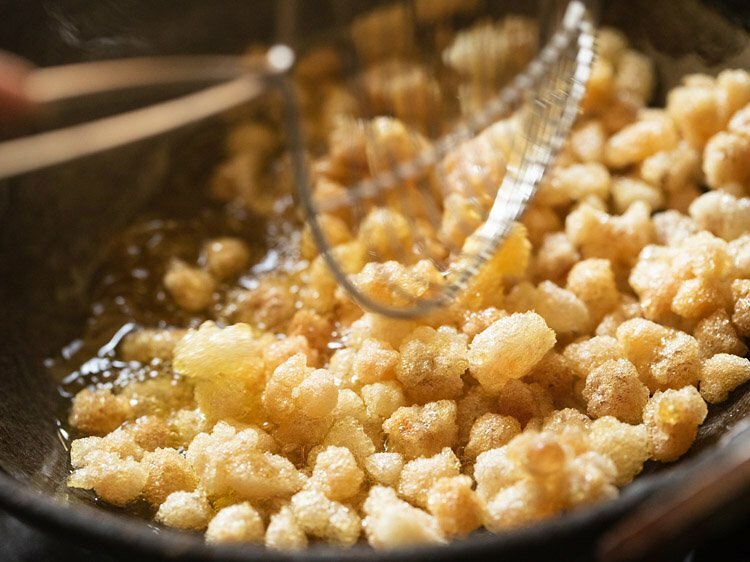 if the mixture does not hold shape, then add 1 to 2 tablespoons ghee. 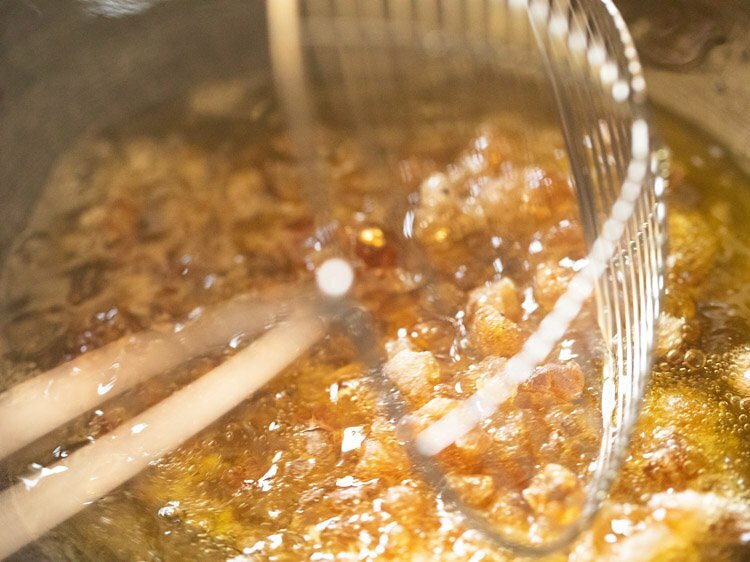 note that the ghee should be in a semi-solid state at room temperature. make medium sized ladoo from this whole mixture. store them in an airtight steel container (steel dabba). gond laddu stays good for a couple of months. this gond laddu recipe can be easily doubled or tripled. from this gond laddu recipe, you can make 17 to 18 laddu. 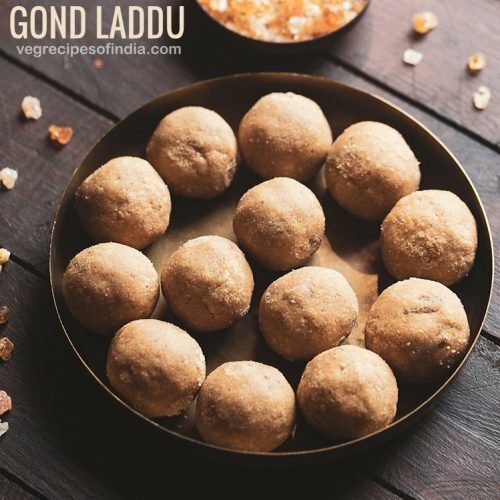 serve gond laddu just by itself or with some hot or warm milk. gond laddu recipe can be halved or doubled or tripled. 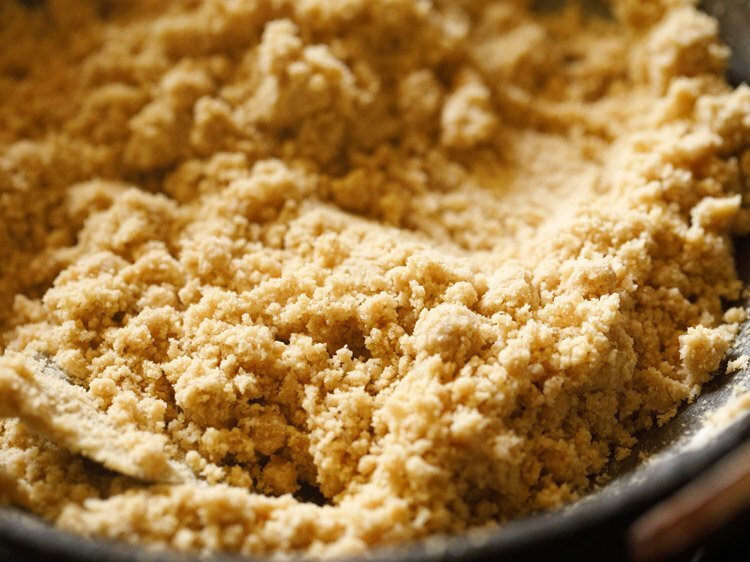 if you are unable to make laddu and the mixture crumbles and looks dry, then add 1 to 2 tablespoons ghee at room temperature. mix and form laddu. 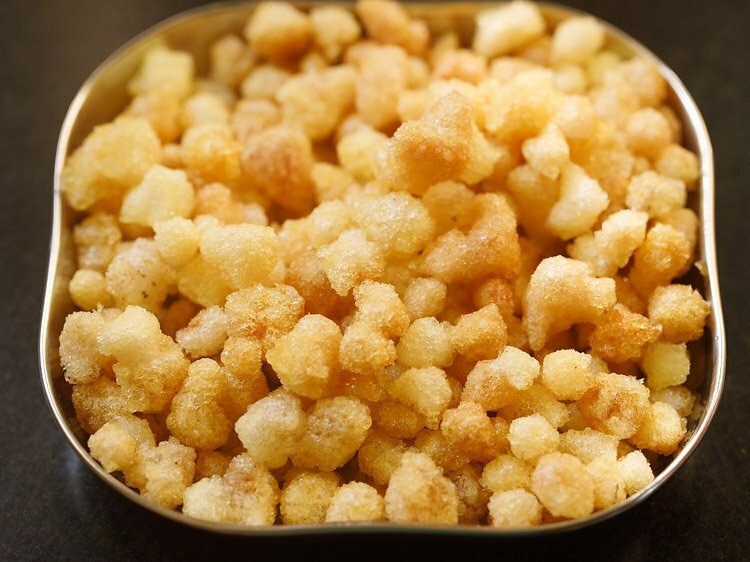 if the ladoo cannot hold shape and flattens then it means there is more ghee. let the mixture cool completely and then shape into laddu. 1. take 1 heaped cup sugar (200 grams) in a grinder jar. 2. grind to a fine powder. remove in a plate and keep aside. 3. keep all the ingredients ready before you begin. heat ½ cup + 4 tablespoons desi ghee in a heavy kadai. please do not use a nonstick kadai. a heavy iron or aluminium kadai works best for frying gond. 4. let the ghee melt. keep flame to medium-low. 5. add 2 tablespoons almonds. 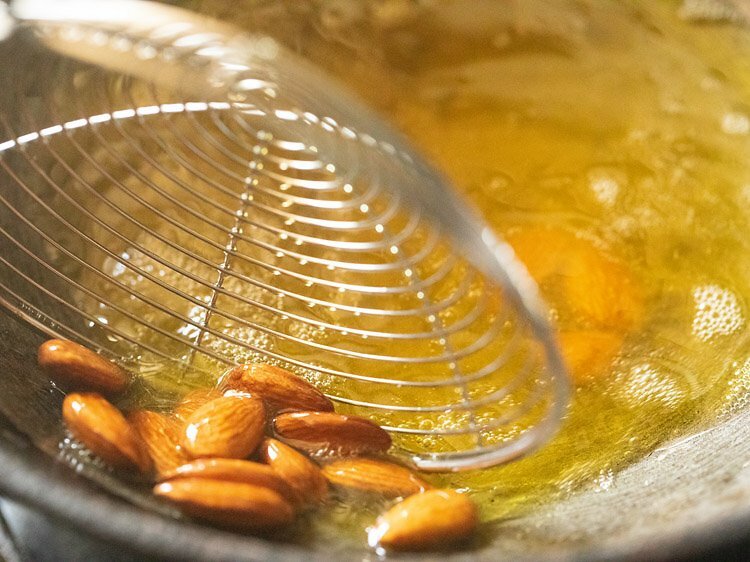 6. stirring often fry almonds. 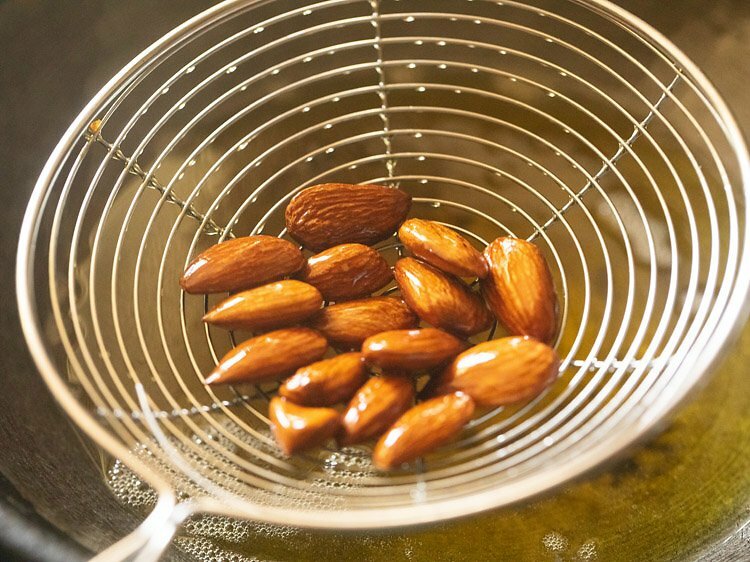 7. fry almonds till their color changes and then remove with a slotted spoon. keep aside. 8. now add 2 tablespoons cashews. 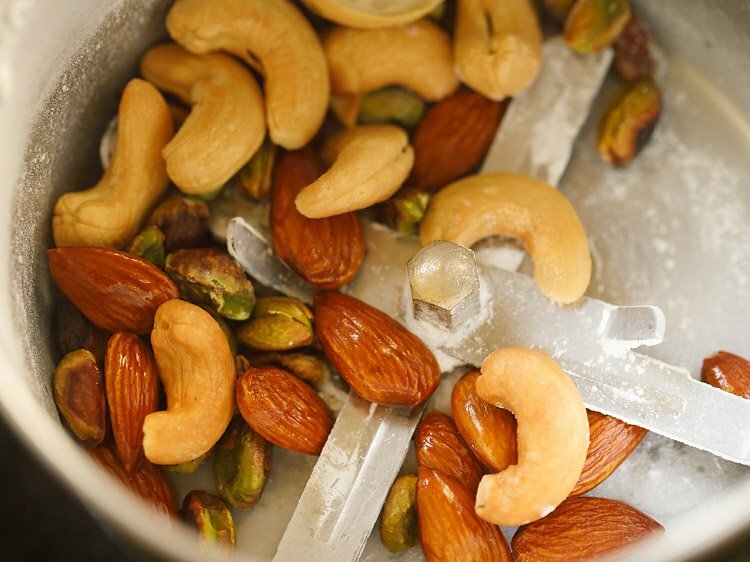 9. stirring often fry cashews. 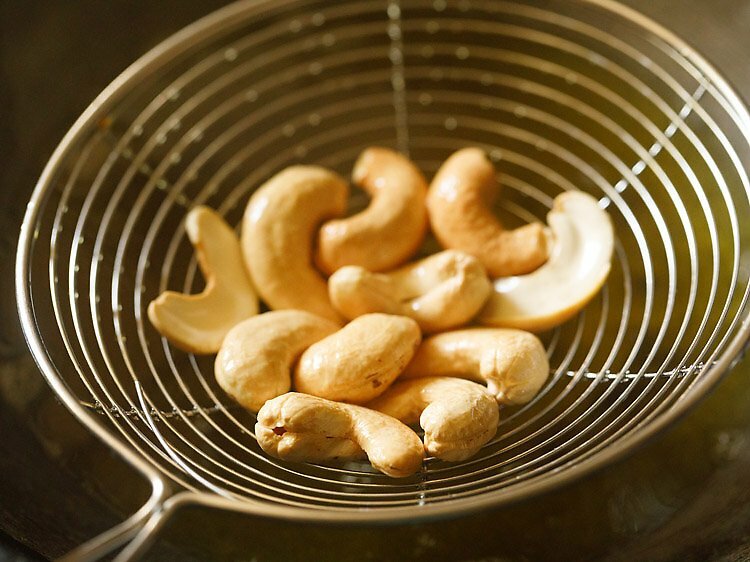 10. fry cashews till they become light golden or golden. remove with a slotted spoon and keep aside. 11. add 2 tablespoons pistachios. fry for some seconds till their colour changes. 12. remove and keep aside. 13. now in the same ghee, add one piece of gond. 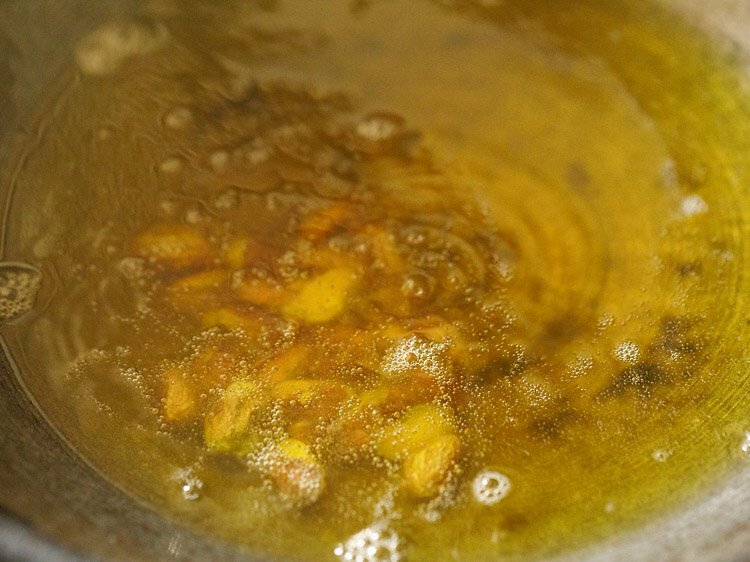 if the gond comes up gradually and puffs up, the oil is ready for the gond to be fried. if the gond settles down in the oil, then increase the flame and let oil become hot. if the gond comes up quickly, then oil is very hot. reduce flame so that the oil temperature reduces a bit. 14. add gond in two batches. 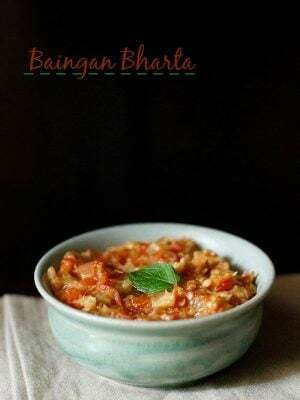 if you are an experienced cook, then add gond in a single batch. i added all the gond at once and fried them. 15. stir non-stop and fry gond till all of them puff up. 16. the gond pieces have to be fried evenly. 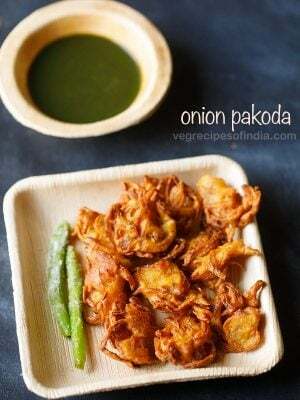 18. fry them well in ghee and do not burn them. 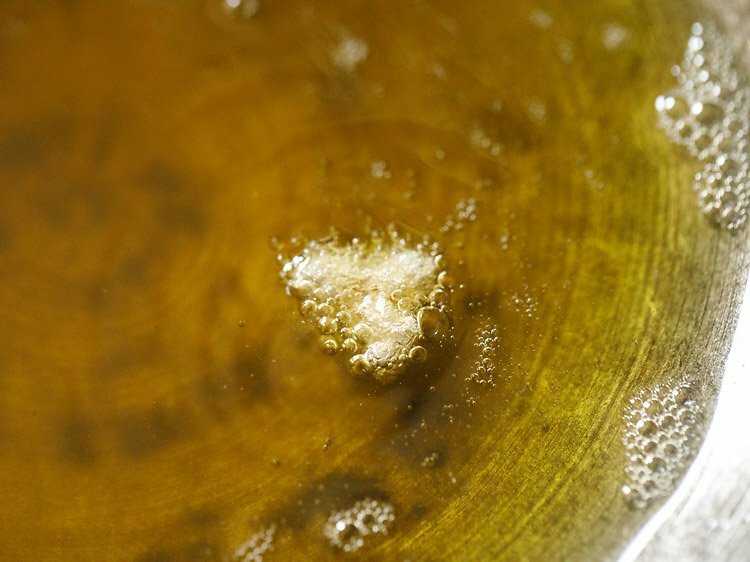 the gond pieces become heavy and puff up when frying. 19. remove the puffed up gond in a slotted spoon. 20. keep fried gond aside. 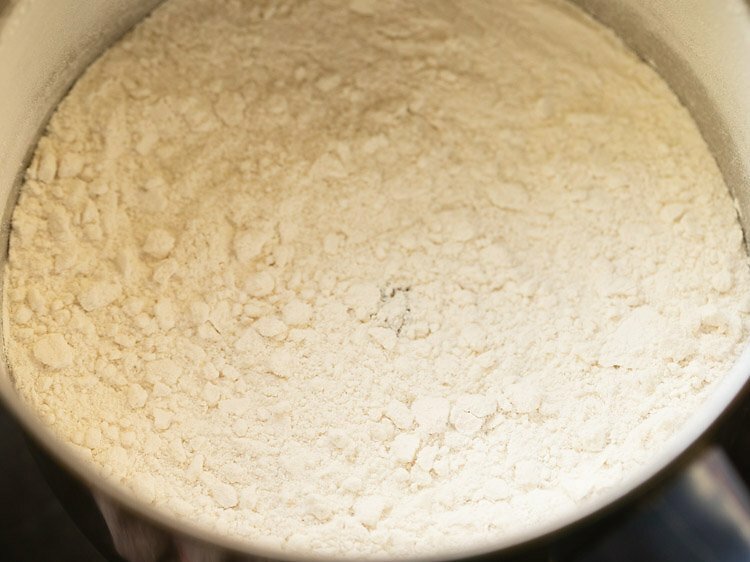 21. reduce the flame to a low and then add 2 cups whole wheat flour in the same ghee. 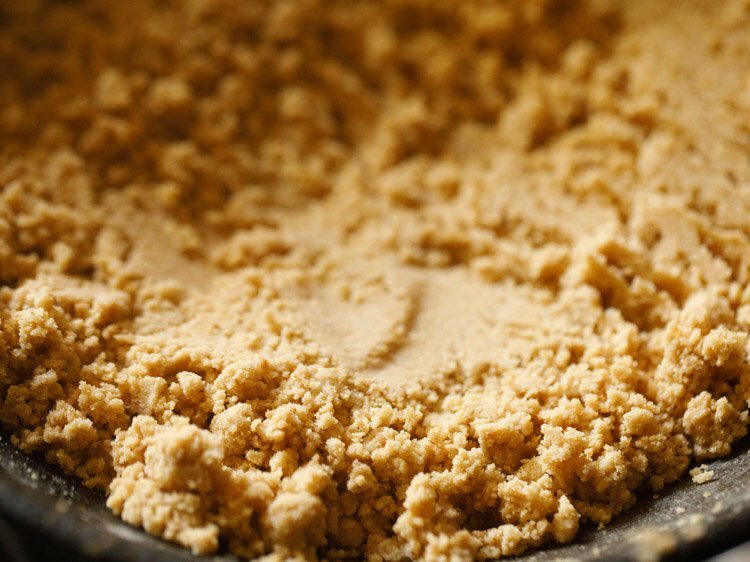 22. mix flour very well with ghee. 23. begin to roast flour with the ghee. 24. meanwhile, when atta is getting roasted, add dry fruits in a grinder jar. 25. also add the fried puffed gond in a dry grinder jar. 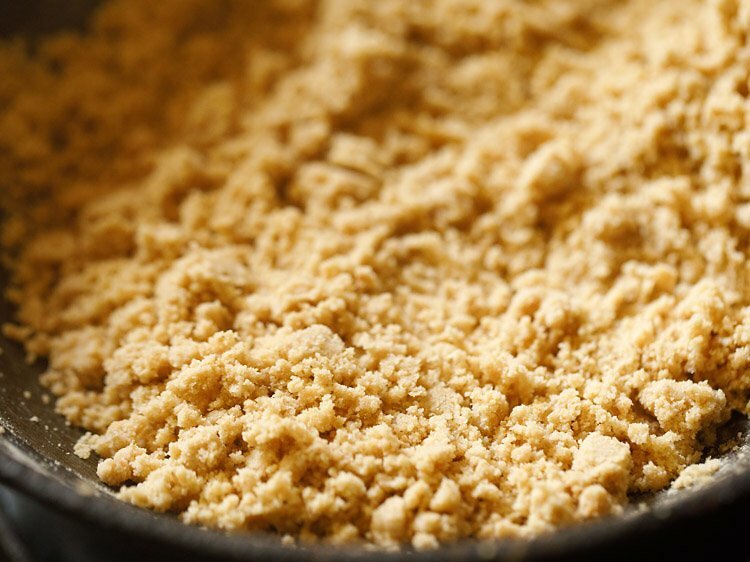 26. pulse and grind to a semi-fine or coarse powder. you can keep dry fruits whole if you want. do note that atta is getting roasted when you grind gond. If you are not able to multitask then switch off the flame after frying gond. crush dry fruits & gond in the grinder. then switch on the flame again and let ghee become slightly hot. add atta and roast. you can also use a belan (rolling pin) and crush gond. keep the powdered gond and dry fruits aside. 27. continue to keep on stirring and roasting the atta. 28. roast atta till its color changes and you get a nutty aroma. then stir non-stop when you see the atta changing its color. 29. stir and roast till the atta becomes golden or brown. overall it took me a total of 17 minutes for the atta to get roasted to perfection (i had used a heavy iron kadai). note that the timing will vary with the material, size and thickness of the kadai or pan. if you use steel kadai, then it will take less time. also, check the taste of the roasted whole wheat flour and it should feel cooked. you should not feel any rawness in the taste. 30. switch off the flame. keep the kadai down and 2 tablespoons raisins and 1 teaspoon cardamom powder. 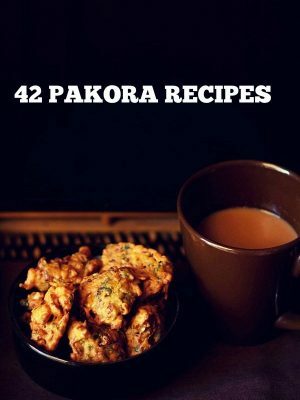 you can even skip cardamom powder. 31. next add the powdered sugar. 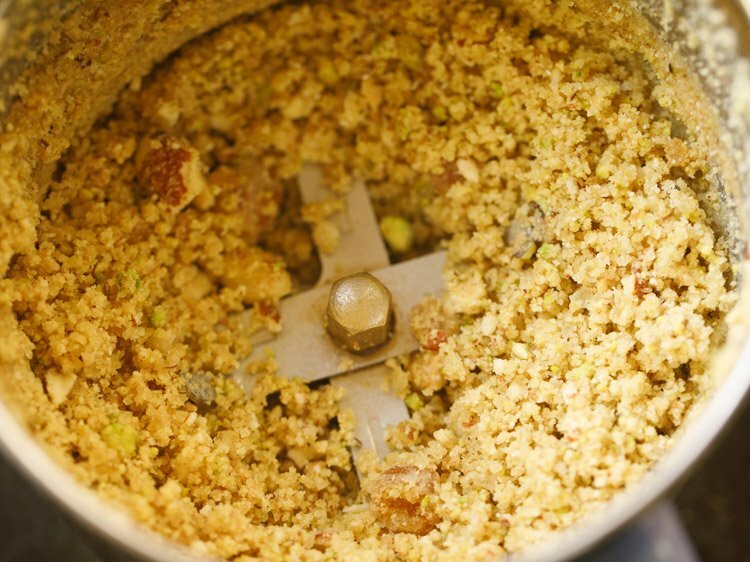 32. add the crushed gond and dry fruit mixture. 33. begin to mix with a spoon. 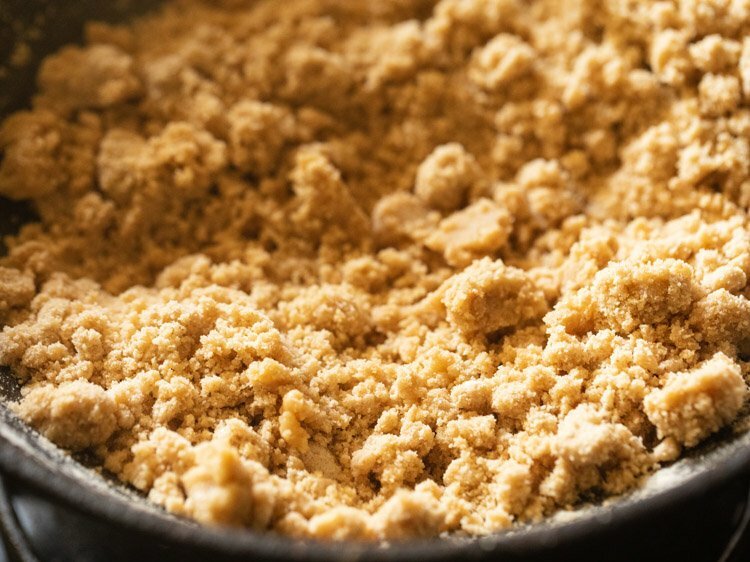 while mixing, break the sugar lumps if any in the ladoo mixture with a spatula or spoon. 35. when the gond ladoo mixture is still hot and the heat is tolerable to you, take a heaped size portion of it in a spoon or in your palms. shape in a round ladoo. in case the heat is not tolerable, then do wait for some minutes. avoid burning your hands. 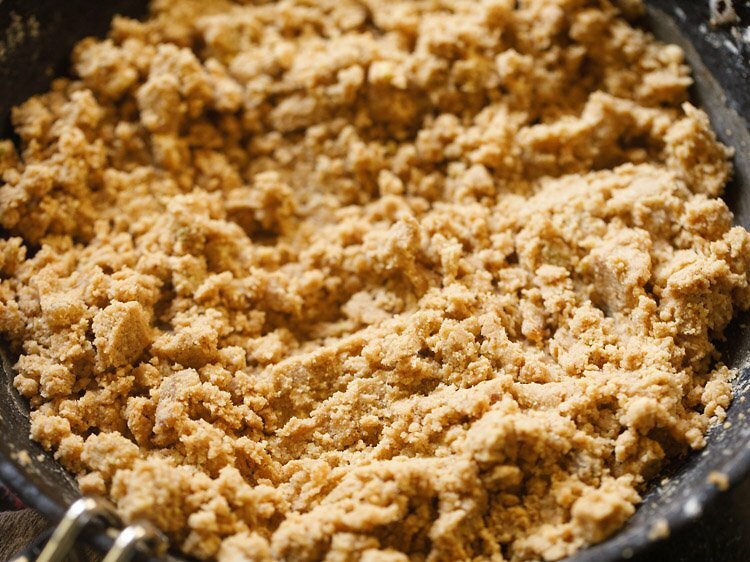 if the mixture does not hold shape, then add 1 to 2 tablespoons ghee. 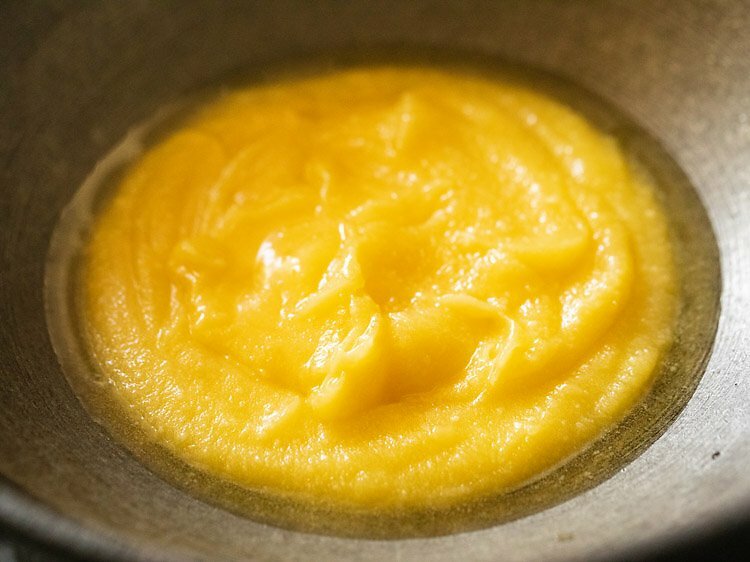 note that the ghee should be in a semi-solid state at room temperature. 36. make medium sized gond ladoo from this whole mixture. store them in an airtight steel container (steel dabba). gond laddu stays good for a couple of months. this gond laddu recipe can be easily doubled or tripled. from this gond laddu recipe you can make 17 to 18 laddu. 38. let the gond ke laddu cool at room temperature. store gond laddu in an air-tight steel container (steel dabba) at room temperature for a couple of months. 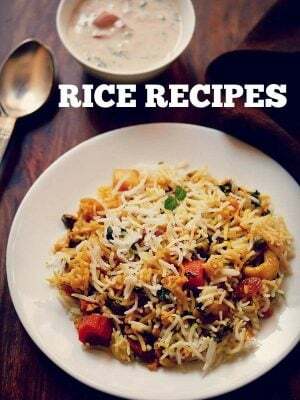 the recipe yields 17 to 18 laddu and can be easily doubled or tripled. you can even half the recipe. serve gond ke laddu as winter sweet snack plain or with some hot milk. 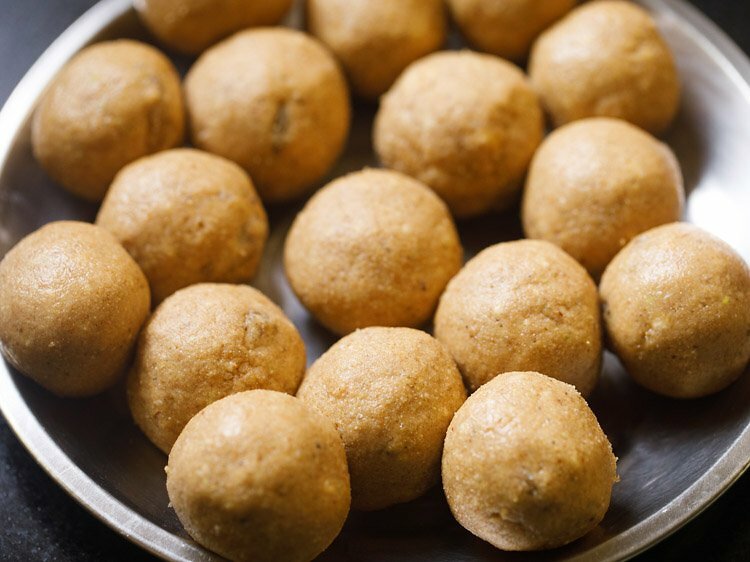 Thank you for this recipe, just wished to confirm – how long can we store these laddus for? welcome ritu. these gond laddu stay good for about a month or a couple of months depending on the temperature in your city. since gond laddu are usually made during winters in india, they stay good for a couple of months. in these hot indian summer months, i would suggest to keep them in the fridge. welcome sabina. you can try. i have never fried gond katira, but i guess it should puff up while frying in ghee. thanks chamy. i have noted down your recipe request for methi laddu recipe and will add in some time. thanks mansi and i hope you dry these healthy gond ke laddu recipe.